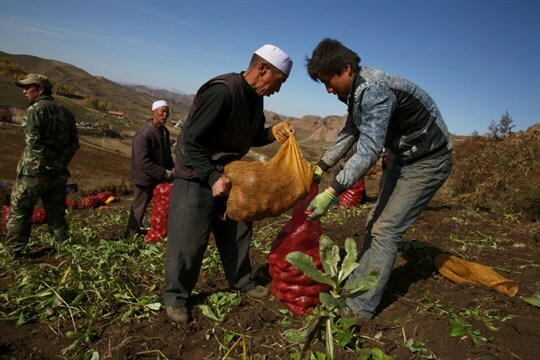 Hui ethnic minority farmers harvest potatoes in northwestern China’s Ningxia Hui autonomous region, Oct. 9, 2015 (AP photo by Ng Han Guan). Since the founding of the People’s Republic of China in 1949, Chinese leaders have struggled with an age-old problem: how to feed a growing population with a small amount of arable land. Despite the country’s agrarian beginnings and the ideological importance of the farmer in Maoist thought, nagging concerns about efficiency, food security and sustainable agricultural development have never been fully resolved.